gallamore west: Happy 6th Birthday Sam! Sam had a great time celebrating his birthday with a few of his close friends, yummy food, and one HUGE snake! He had a How To Train Your Dragon party and since we couldn't find any real dragons we had "Ben the Reptile Guy" come out and do a reptile presentation. He brought a bunch of snakes, including "Fluffy", the big one in the last picture. He also brought a blue-tongued skinx, a pancake turtle, a tarantula, two bearded dragons, a gecko, and more. It was definitely a memorable afternoon in the Gallamore backyard! 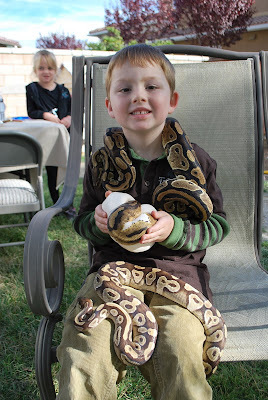 The Birthday Boy with three snakes! 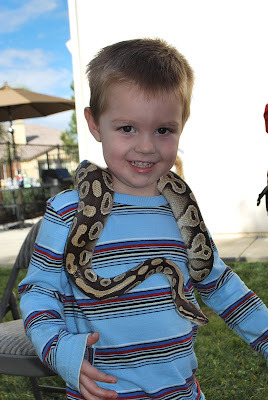 A snake slithering around on Jake! Sam wasn't too sure about letting the skinx give him a blue-tongued birthday kiss! Awesome Birthday Sam. Looks like what every boy would want.